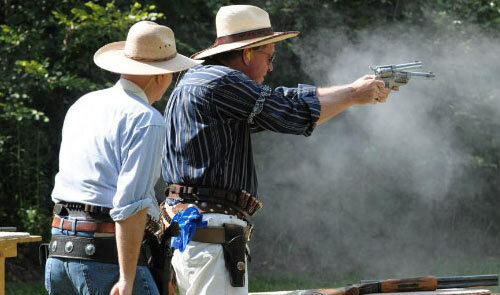 By Coyote Calhoun, SASS: As most of you may have already heard the Shootout at Mule Camp will not be held this year. For 14 years the SASS Southeastern Regional has been at the Shootout At Mule Camp and it has been one of the brightest stars in the SASS National Championship program. But, sometimes good things must come to an end. SASS would like to congratulate all of the committees, volunteers, vendors and sponsors who worked so hard and added to the success of Mule Camp. Thank you for allowing so many of us to come and have fun. So, where does the SASS Southeastern Regional go for 2010? It gives me great pleasure to announce the Geechee Gunfighters will host the SASS Southeastern Regional. The Geechee Gun Fighters have presented the Shootout at Givhans Ferry, the South Carolina SASS State Championship, for the past 14 years and have done a wonderful job. The new regional match will have a new name but still retain Givhans Ferry as part of its heritage. The dates for the match will be the same weekend as the state match, November 11-14, 2010. I am sure you will not want to miss the first SASS Regional held in South Carolina and join me in being a part of this great match. I hope to see you in coastal South Carolina for some good seafood and good shooting at the kitchenfoodnmore.